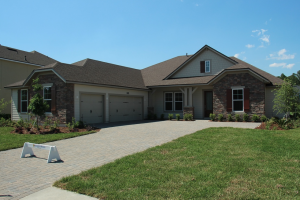 If you’re looking for a fabulous new 100% ENERGY STAR® Certified Providence Home in St. Johns Forest, you should visit the Collier Inventory Home right away. Located at 356 St Johns Forest Blvd, the Collier offers 3318 sqft, 4-bdrm 3-bath, Owners Spa Bath, Formal Dining, Kitchen/Café, Family Room, Study, Covered Patio, 3-Car Garage w/ Paver Driveway on a lake front home site and is available for immediate occupancy. This 100% Energy Star Certified luxury home was designed from the ground up as a true model of energy-efficiency---not just a bunch of energy-efficient parts. The Collier includes a new innovative open-cell spray foam insulation that is applied under the roof deck to provide our homeowners with years of quiet enjoyment, consistent comfort, superior energy savings and a greener insulation alternative. Interior design elements include Ceramic Tile Flooring in Foyer, Family Room, Dining, Bathrooms, Laundry & Kitchen/Café; Crown Molding throughout Main Living Area; Designer 42" Cabinets in Kitchen w/ Large Crown Molding; Gourmet Kitchen w/ Granite Countertops and Island; GE Stainless Steel Appliances w/ Built-In Cook-top and Oven/Microwave Tower; 8' Interior Doors Throughout and more!!! The energy-efficient features included with this plan include ENERGY STAR® Certified Home; ENERGY STAR® Dishwasher; ENERGY STAR® Vinyl windows w/ Argon Gas Fill Low-E Glass; Programmable Thermostat; 2x6 exterior walls w/ R-21 Insulation; Open cell spray foam insulation under roof deck for superior energy savings; CFL Lighting and Fixtures and more! Providence Homes will pay "Up To" 3% towards closing costs and prepaid with the use of preferred lender. Contact Melissa Matthews at 904-337-5236 for more details.